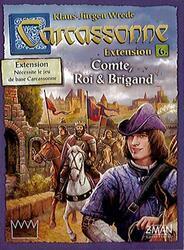 This sixth expansion in Carcassonne offers players 4 mini-expansions. The Count of Carcassonne helps players by allowing them to seize areas already occupied. River 2 changes the beginning of the games by creating a winding two-armed river. The King and the Knight-Robber reward the player who completes the longest city and the one completing the longest route.